South Dakota’s Custer State Park is celebrating 100 years of providing outdoor recreation for not only South Dakotans, but the world’s population. 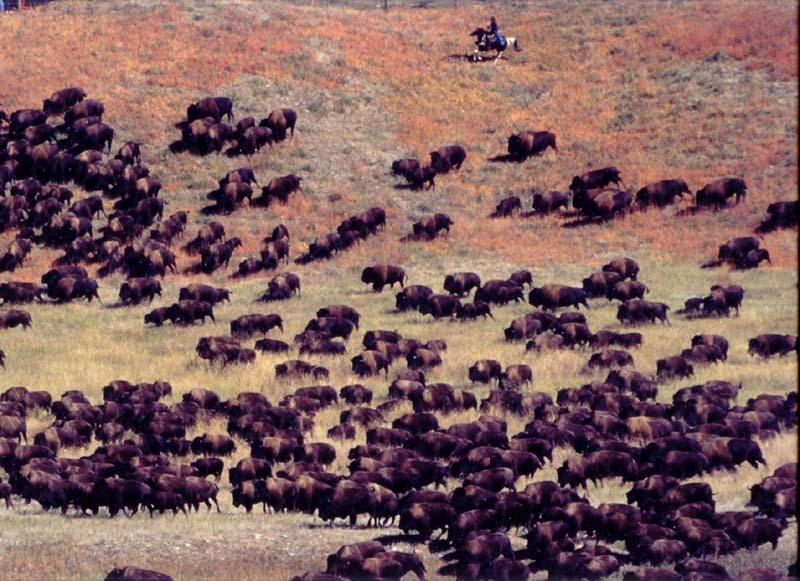 For the last 54 years, they have held a Buffalo Roundup that is second to none. 1400 head of Buffalo running hard with the riders in hot pursuit, yelling and cracking their whips In the first few years, it wasn’t well known, but now over 14,000 people from all over the world each year thrill to the sight of the herd running hell bent thru the hills with the riders pushing them toward the corrals. You can be a part of this great adventure on one of our safe, trailwise, surefooted, well trained, reliable, gentle saddle horses. Granted you will not be herding the Buffalo, but you will be in close proximity to the herd as it moves along towards the corrals. Tuesday - The first day, your guide will take you on a horse back visit to areas seldom seen in Custer State Park. After supper we will have lots of Cowboy songs, poems and stories. Wednesday - We will ride over to the Badger Hole, home of the Poet Laureate of South Dakota and Arizona, Badger Clark. He wrote some great Cowboy poems which have been made into songs. We will perform some of Badgers works on the porch of Badger's Cabin, the Badger Hole. Wednesday nite, we will have Cowboy songs, poems and stories around the campfire. Thursday - We will take you down the beautiful French Creek Canyon and return on the Rim trail. That evening we will again have Cowboy songs, poems and stories around the campfire. Friday - After an early Breakfast at Blue Bell Lodge, we will trailer the horses to the Buffalo Corrals and the roundup teams will be briefed on the way things are supposed to go. Doesn’t always work out that way. 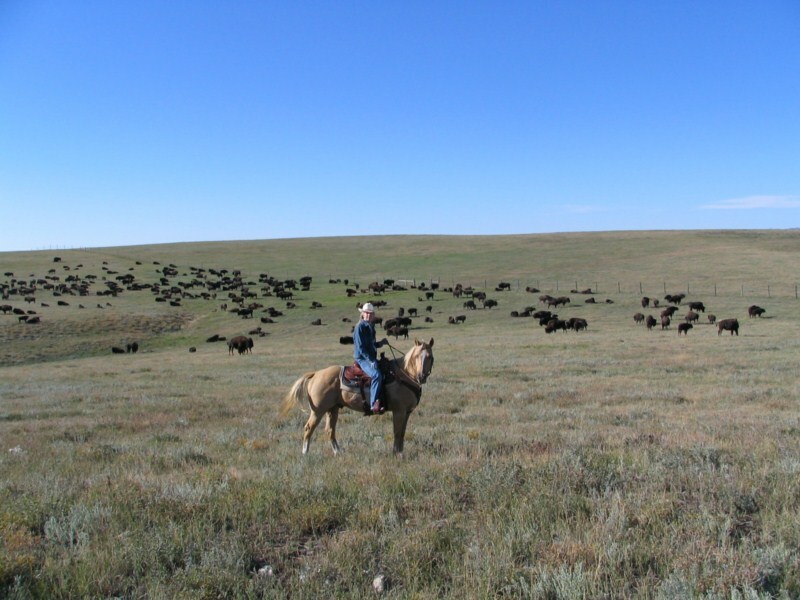 You will be in a great area to view the Buffalo Roundup horseback. After the Buffalo have been gathered and we eat lunch at the corrals, you can watch the sorting & branding of the Buffalo from the catwalks above the chutes. When we return to camp, the Buffalo Roundup and Trail Ride is officially over. We will return you to your motel and we will break down the camp and head for home. If you decide to stay in the area, the Custer State Park Arts Festival will be in full progress Friday afternoon and Saturday. During your stay in Custer State Park, you will have the possibility of seeing Buffalo, Elk, Deer, Big Horn Sheep, Coyotes, Eagles, Prairie Dogs, Antelope and even Mountain Lions, which we have seen in the past. Naturally, the Camp Cooks will have some of the best food in the West, served up hot and delicious. You will be staying in Range Tents with floors and zippers and living the Cowboy Way, with modern toilet and shower facilities available at the end of each day’s ride. Now to cap things off, the evenings will be spent around the campfire listening to the songs, poems and stories of the West presented by a host of western entertainers. And most likely, a few coyotes will be harmonizing in the background. What a way to start the Fall Season, viewing the Buffalo Roundup horseback and lots of beautiful country to ride in. 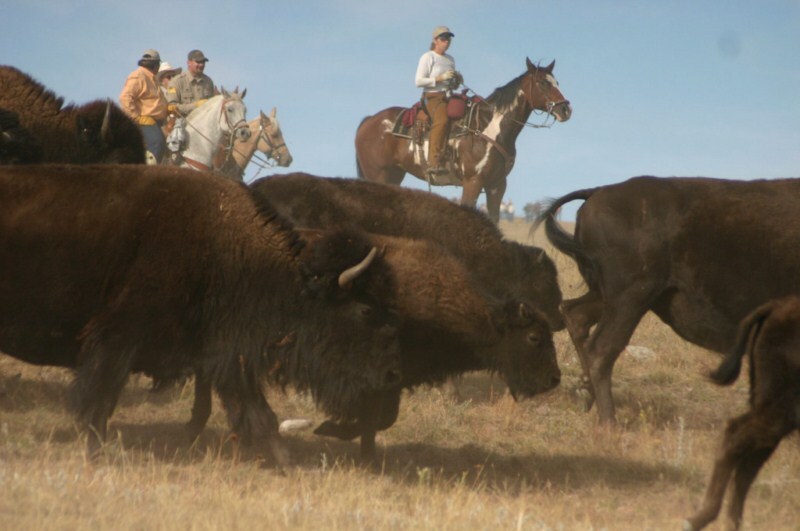 The price for this 4 day fantastic Buffalo Roundup and Trail Ride Adventure is $325.00 per person per day plus 6% state sales tax. A deposit of 50% of the total due is required to hold your reservation with the balance due 30 days prior to the start of the Roundup. We accept Master Card, Visa and Personal Checks. This will be the adventure of 2019. We were featured in a "BORN TO EXPLORE" TV episode and AMERICAN COWBOY COLLECTORS ADDITION MAGAZINE IN 2013 and in 2016 the Buffalo Roundup was featured on CBS Evening News.